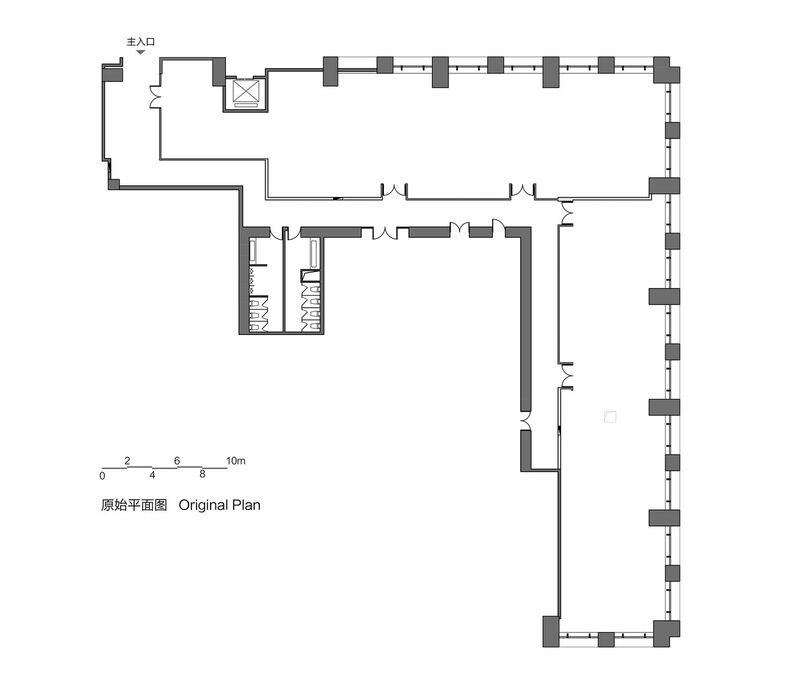 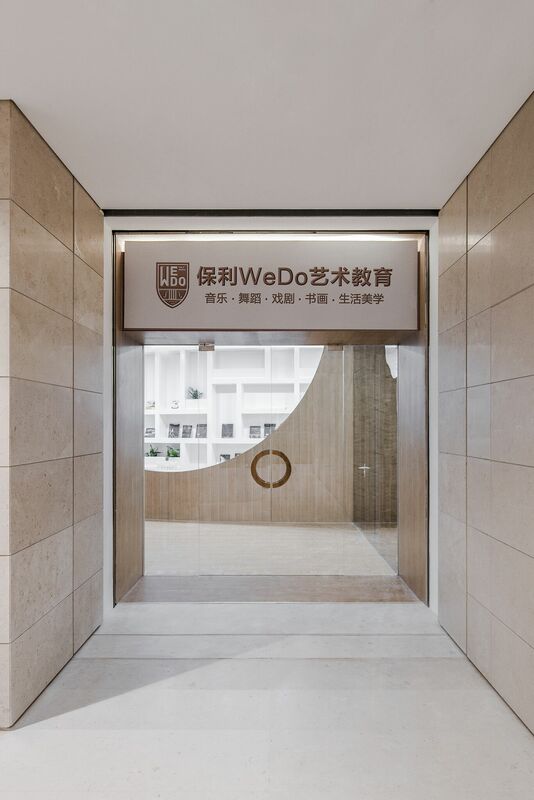 The graphic design of the original building is L-shaped, and the entrance is located in the end of one side, thus the streamline from outside to inside is relatively long. 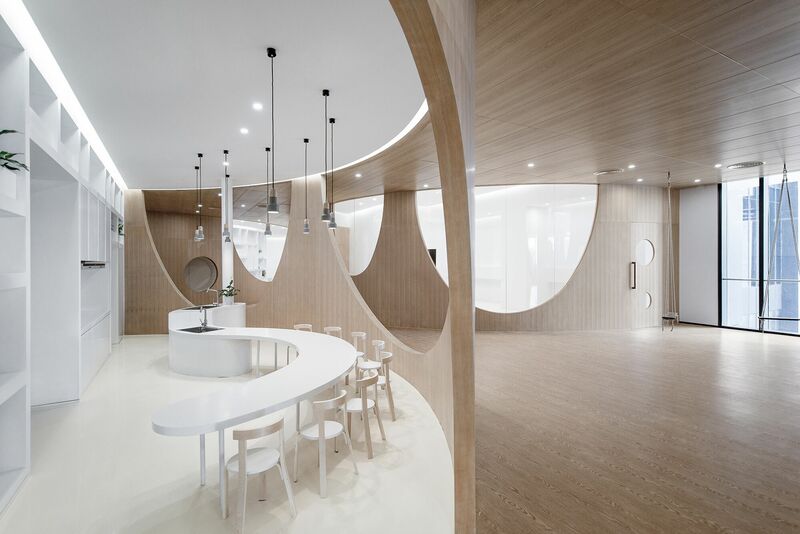 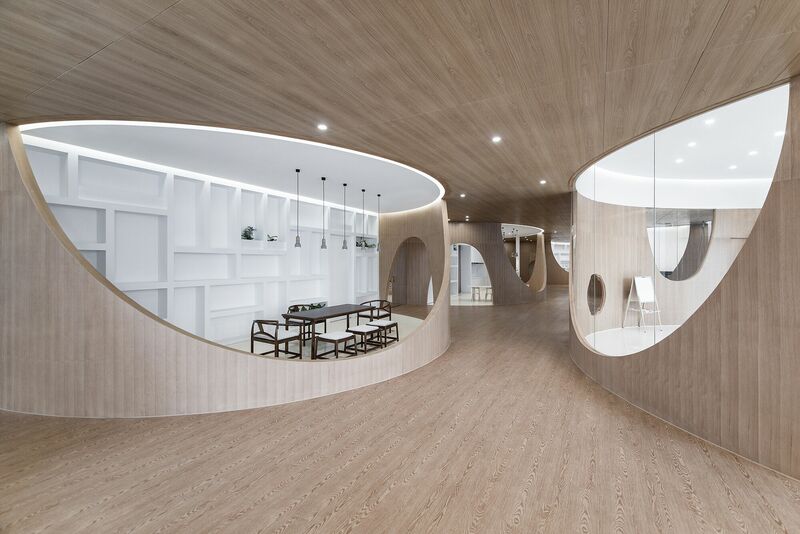 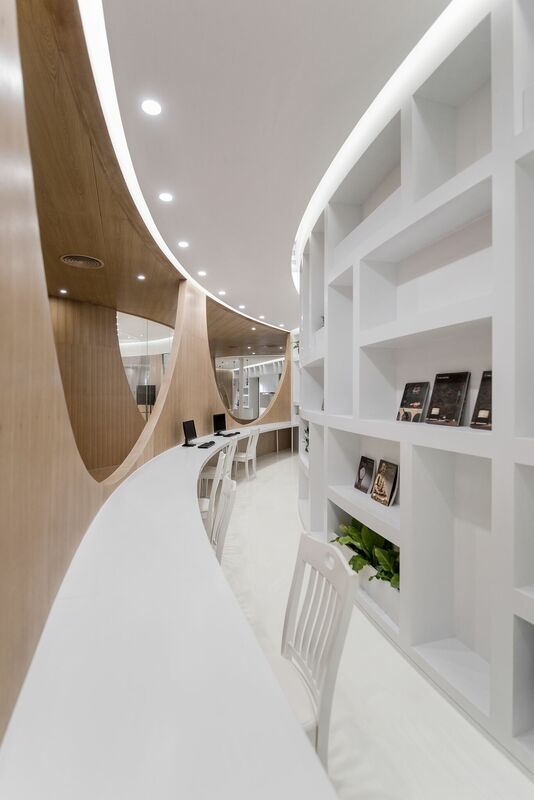 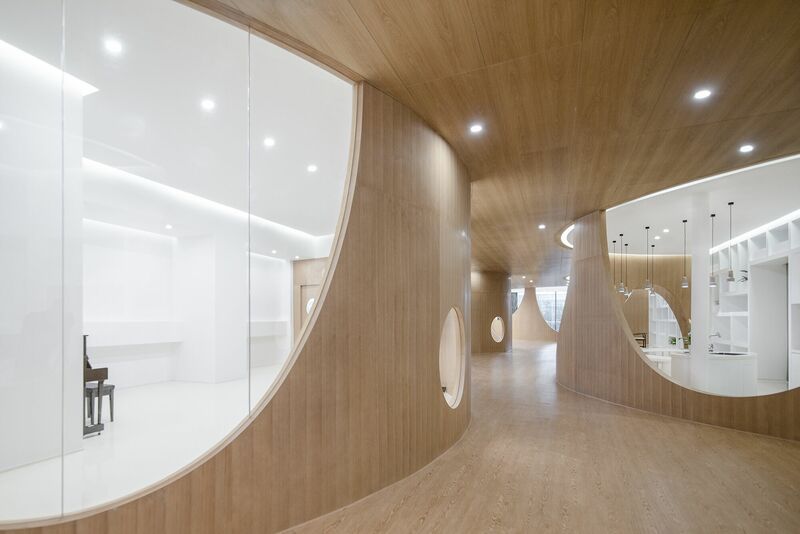 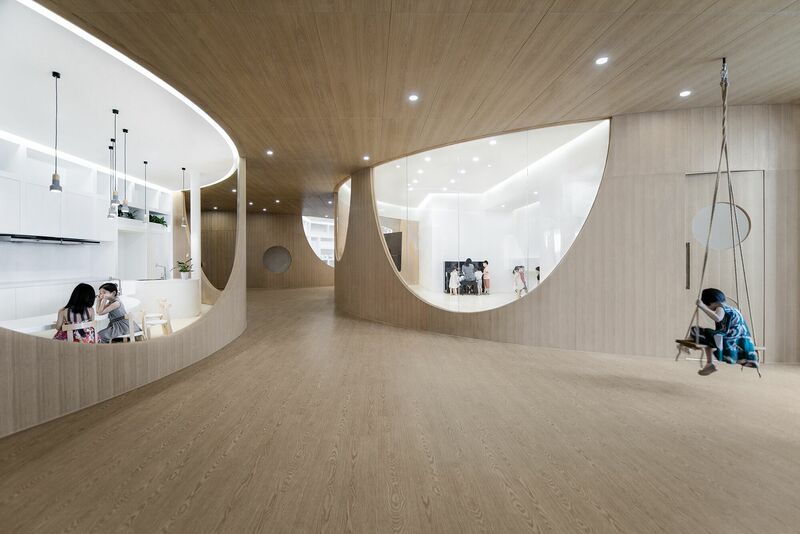 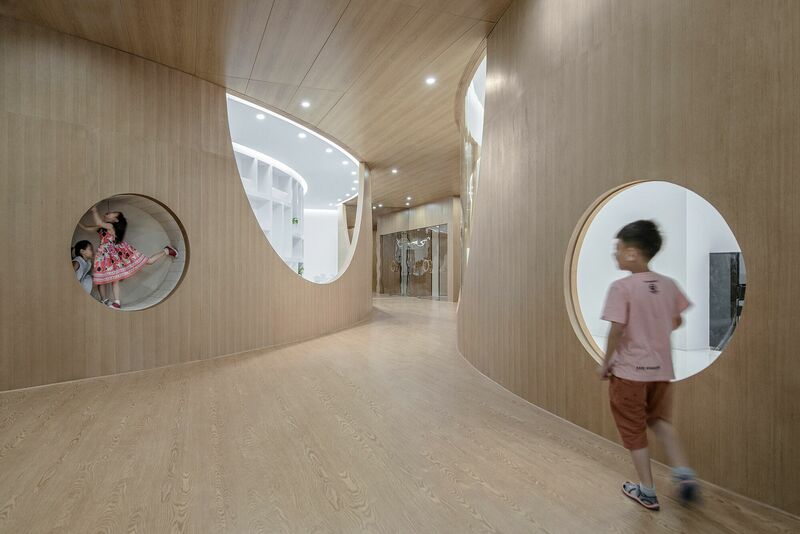 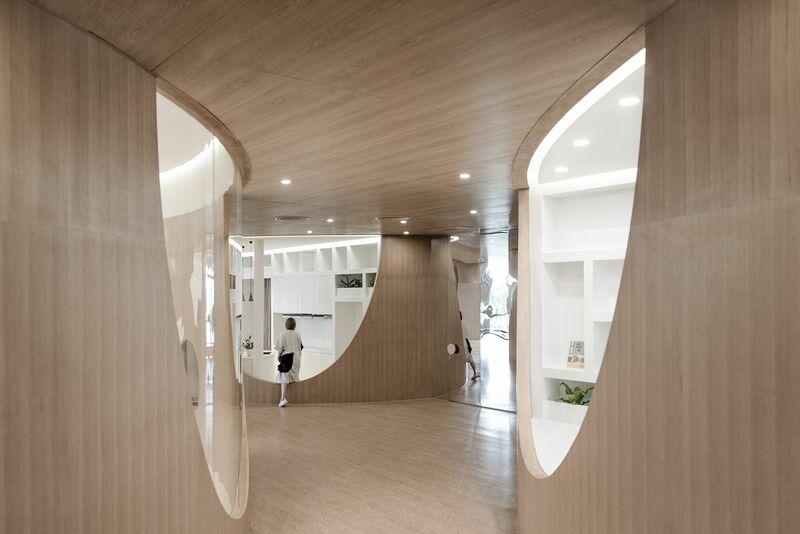 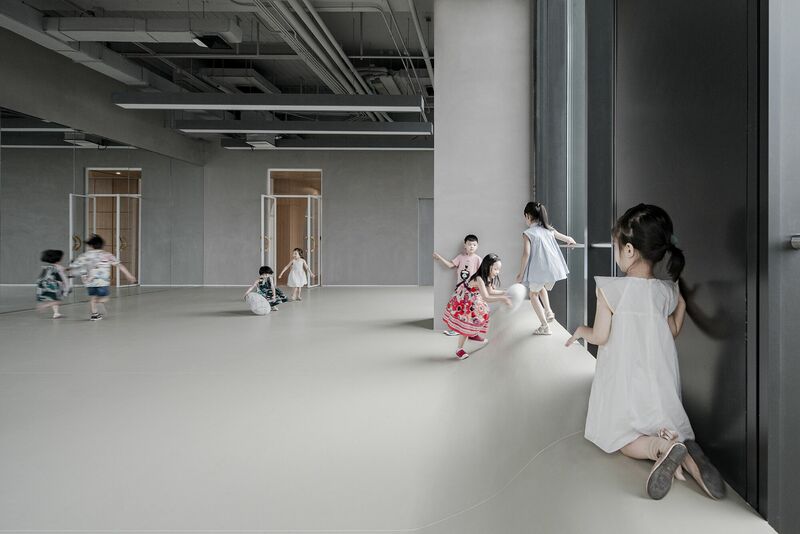 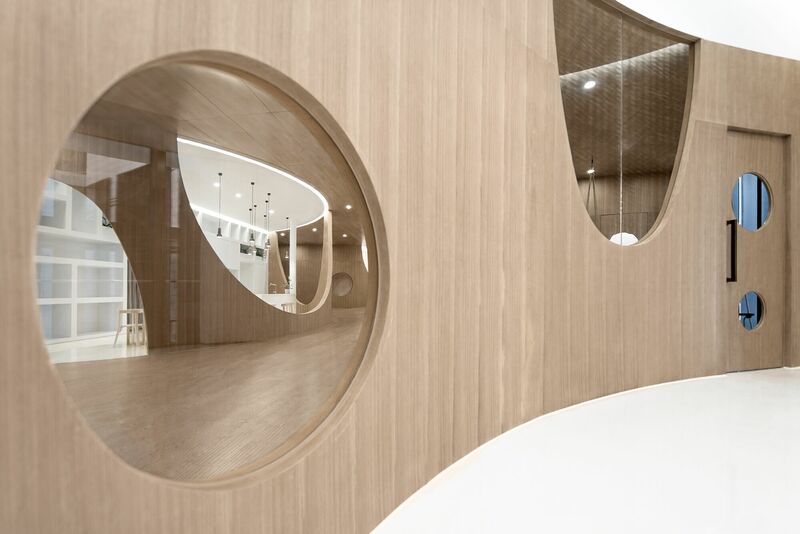 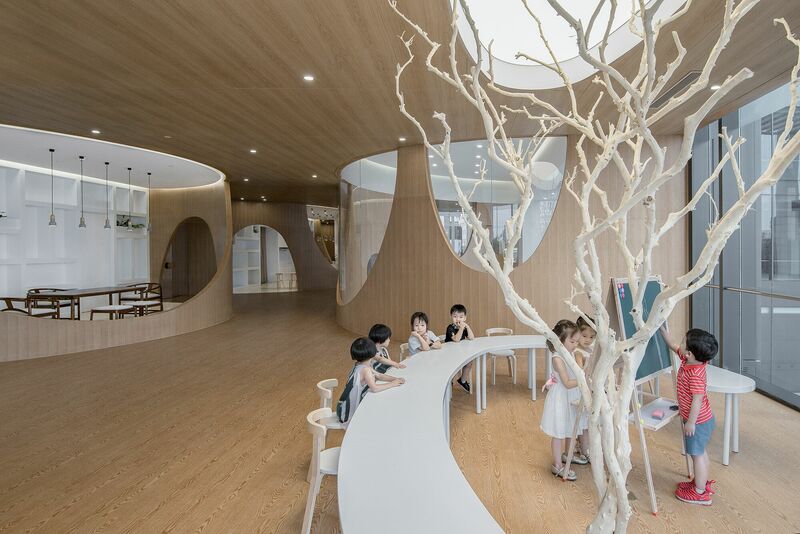 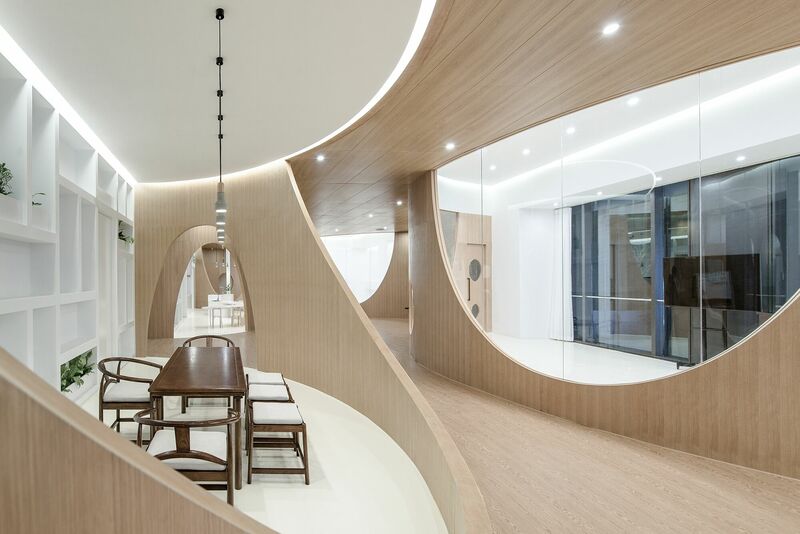 A winding corridor is squeezed out by continuous curved walls, different from traditional boring straight corridors, it stimulates children’s desire to explore. 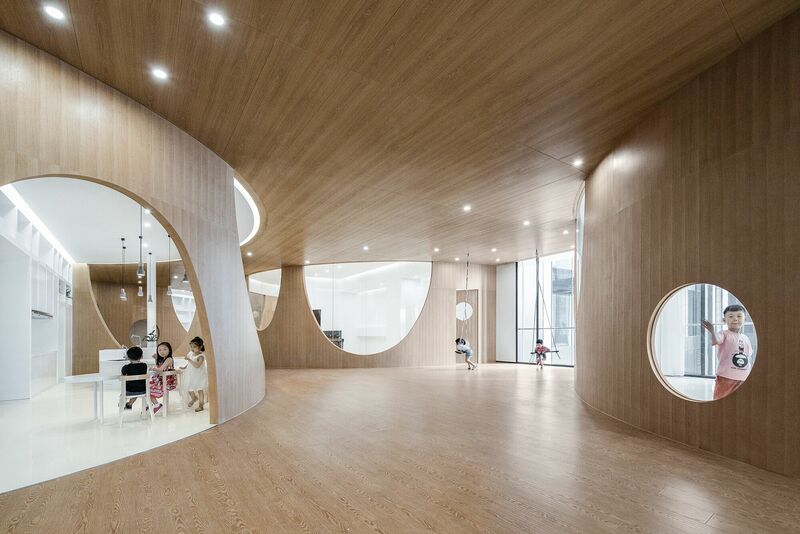 Curved walls differentiate musical classroom, reception area, cooking area, tea classroom, play area and so on. 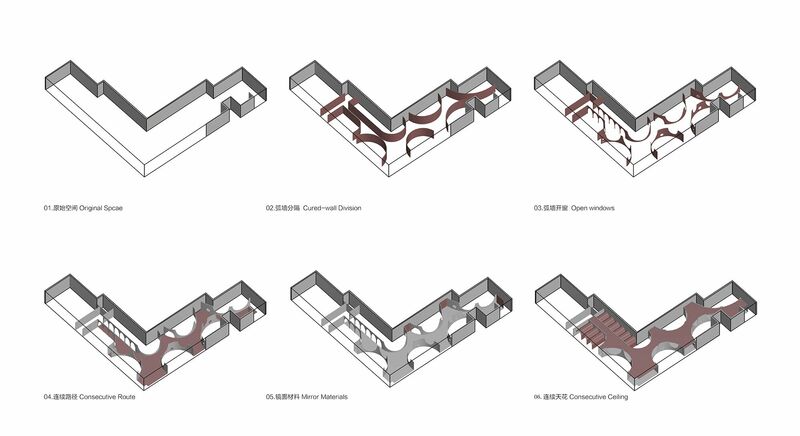 A series of up and down arch caves further change the virtual-real relationship of each area, creating layered and crossed visual interest. 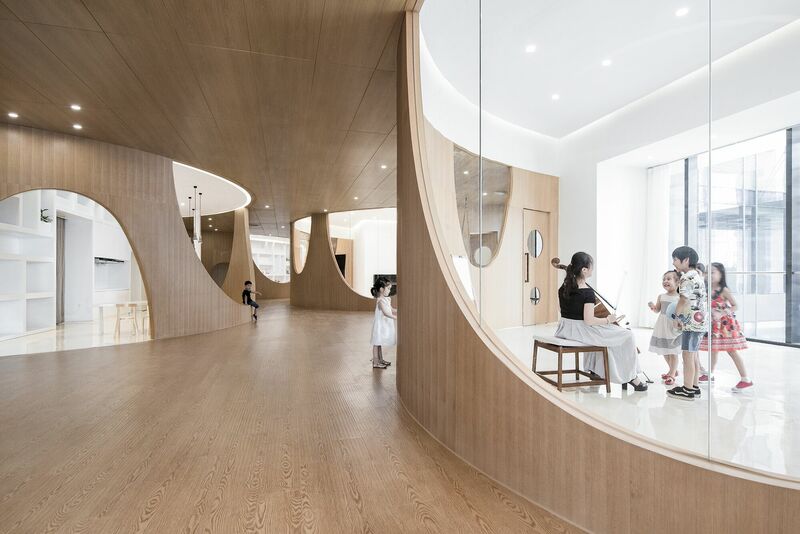 Children will find some rooms are dark closed valleys, some are open and transparent hills, while some are holes that hold 2 children only, when they are in the corridor. 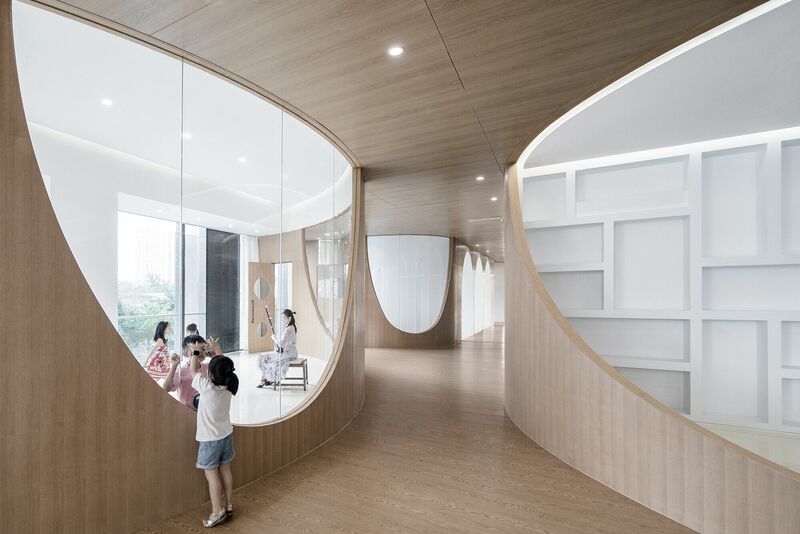 The musical classroom is sealed by curved glass to ensure sound insulation and also realize an open teaching environment. 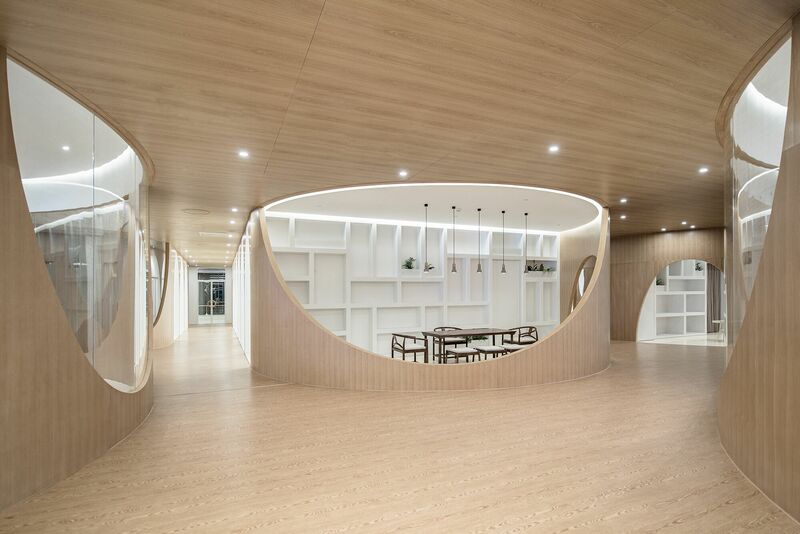 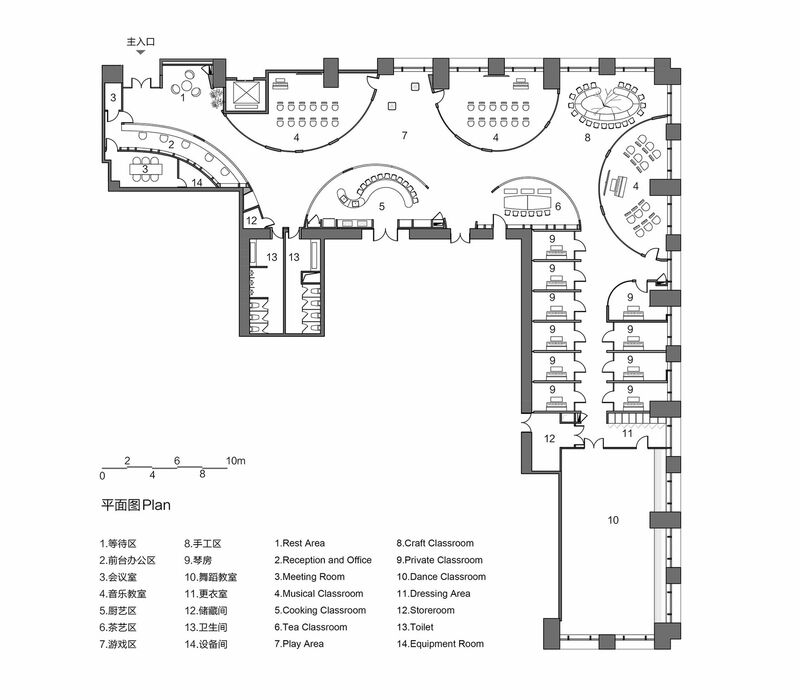 The tea classroom and the cooking area are separated by reverse-arch walls, which are also tools for children to stride, rest, and play. 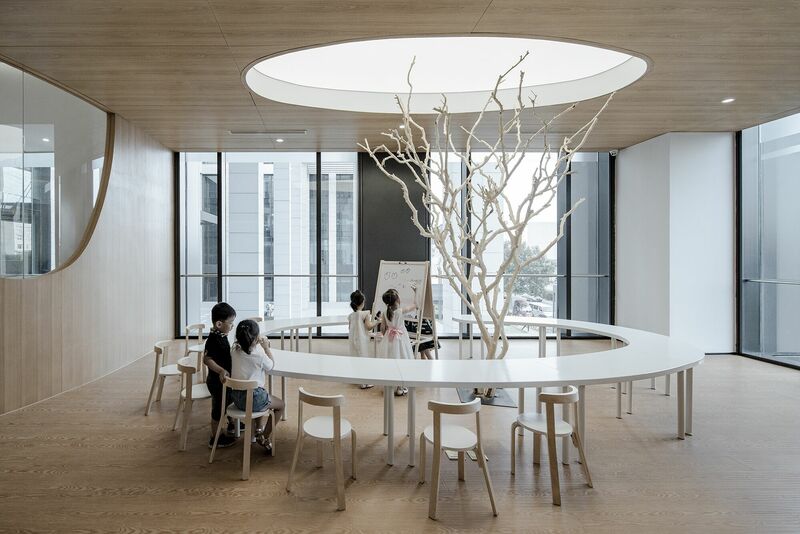 The craft classroom is at the corner of the corridor, children can sit around the tree to do handwork. 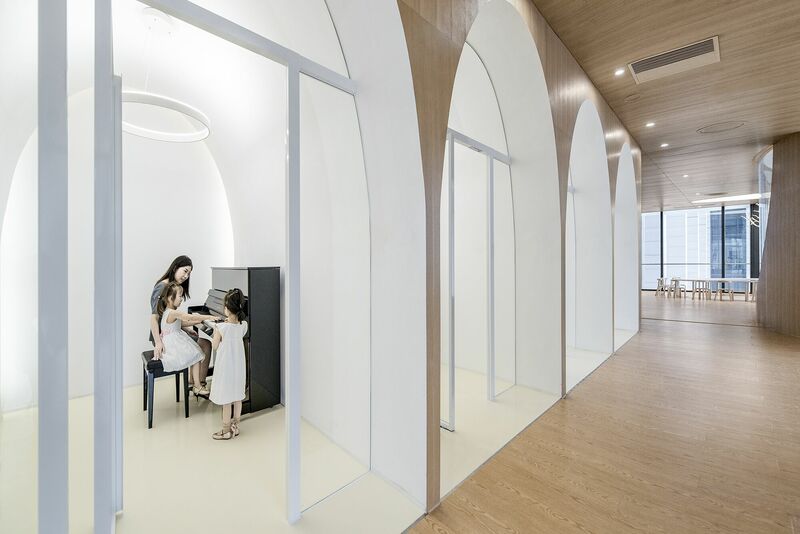 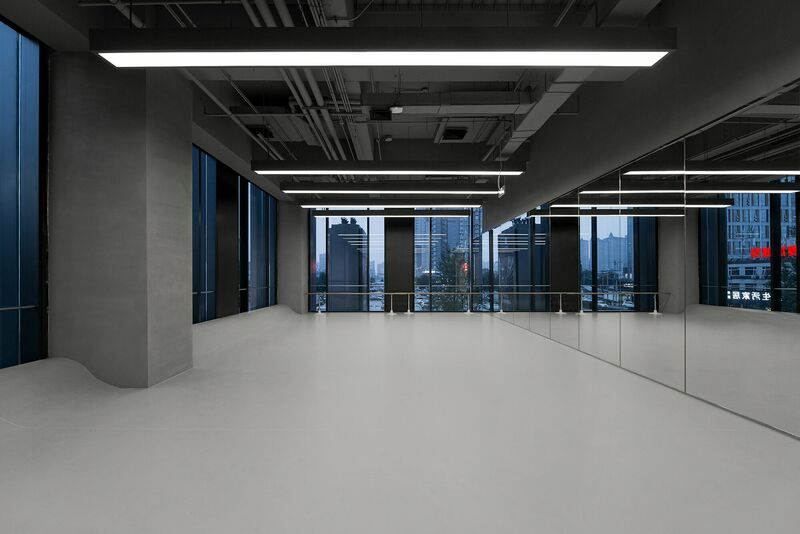 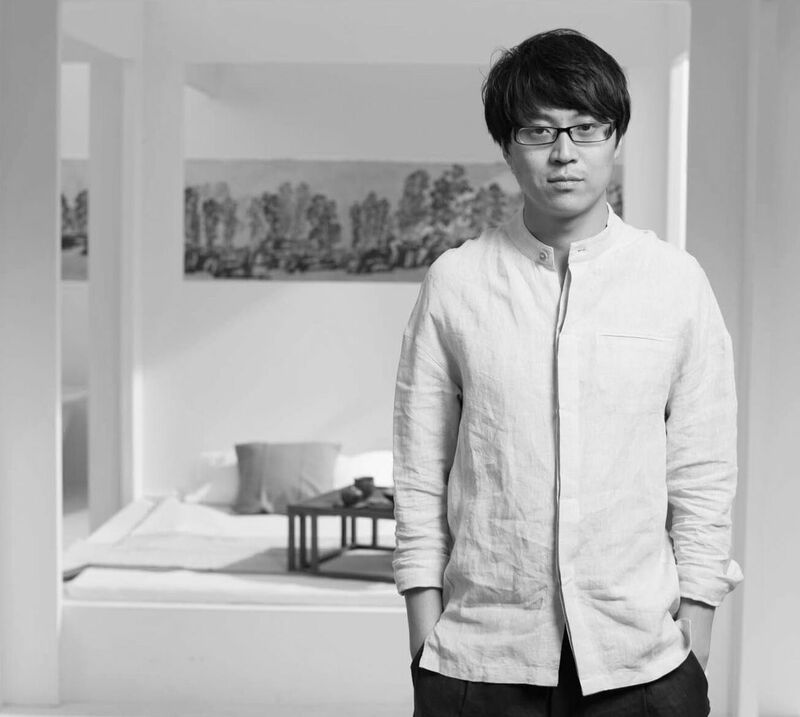 Nine private piano classrooms are arranged on both sides of the corridor, each classroom is designed as a small cave, which ensures acoustic quality as arched wall is conducive to sound mixing. 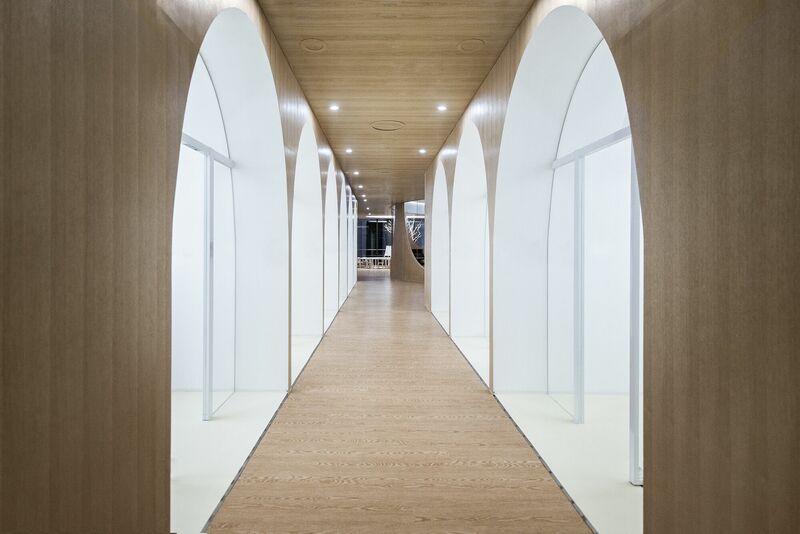 Wood color is the major tune of the corridor, some walls are mirrored stainless steel, and the reflection of materials help create a deep and dazzling space to increase the enjoyment of materials experience. 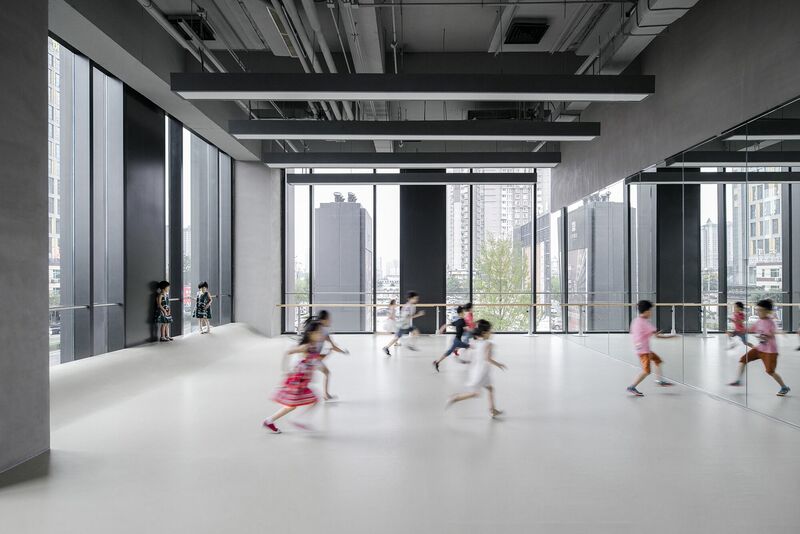 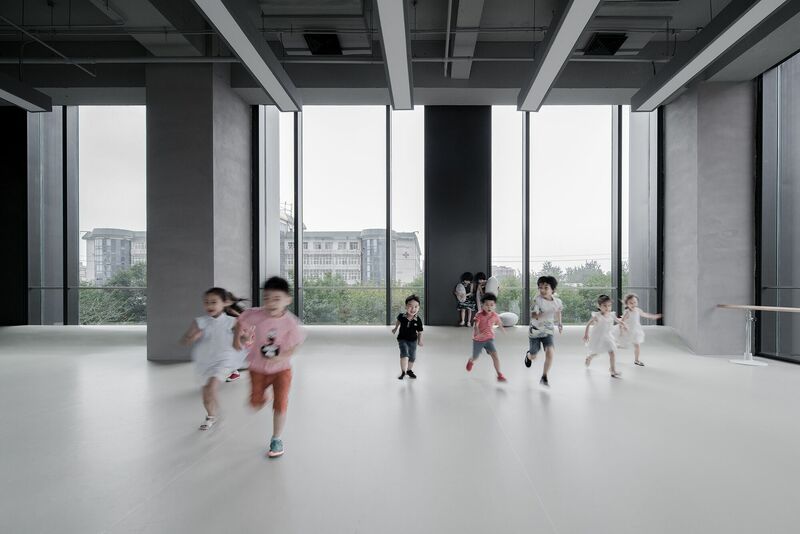 The end of the corridor is dance classroom, which is positioned as an “exterior space” as a contrast to the general wood color space. 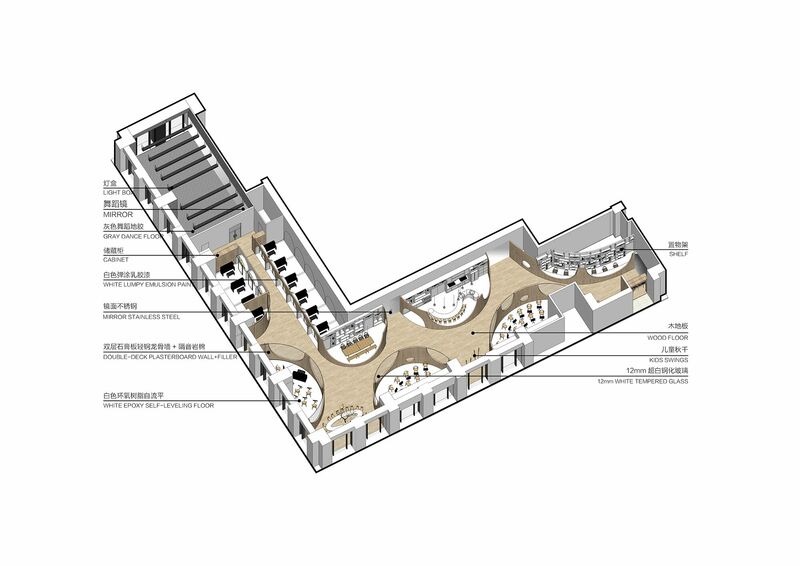 The original structural pipelines of the building are all exposed, the gray glued flooring on the ground raised beside the window as a seating area. 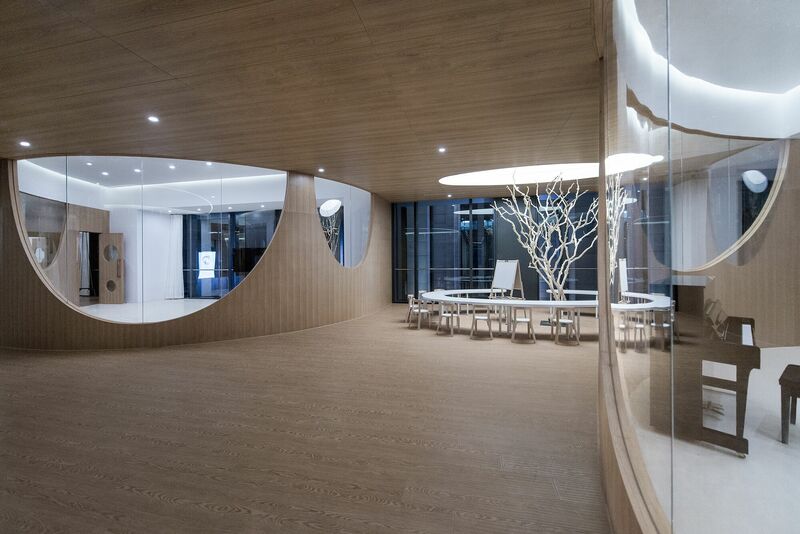 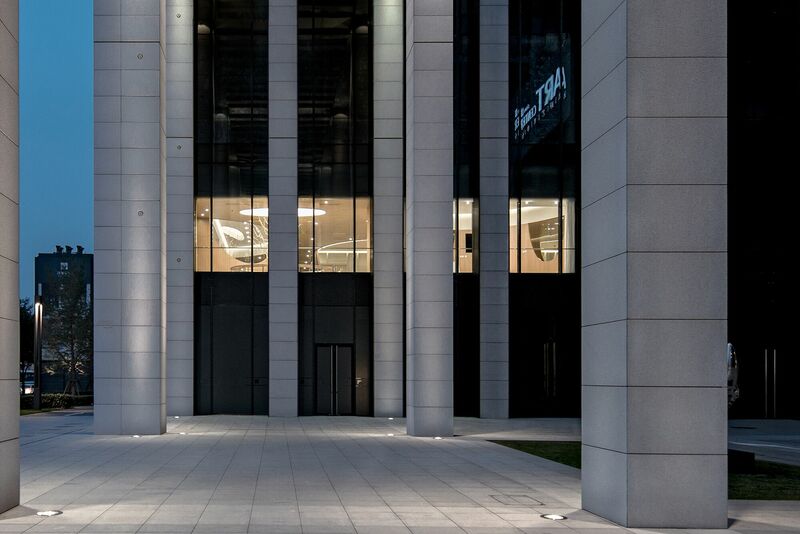 Transparent floor glass, floor dance mirror and the outdoor trees set each other off, the indoor and outdoor scenes are naturally connected.